King of the Desert, Captive Bride features Egypt, one of my dream destinations, as its setting. I’ve always wanted to visit Egypt and am fascinated by the tombs and stories of the pharaohs, so much so that history and temple and tomb crept into the story. Sheikh Khalid Fehr is an anthropologist and Olivia Morse is a travel agent—perfect for cruising the Nile and following in love between visits to temples and tombs. Nile River – take a cruise to visit the architectural attractions in Luxor, Aswan and the Red Sea. People in the Middle East consider Egypt to be the gift of the Nile, the river which has been the focal point of Egyptian life for tens of thousands of years. 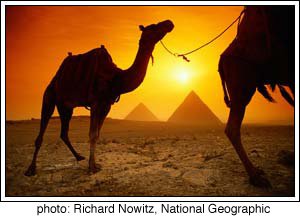 The two most prominent areas of Egypt are the Delta and the Nile Valley. The ancient people of this country believed the waters of the Nile came from a ‘mysterious heaven of plenty’ and even today, Egypt relies heavily on the Nile for food, water and transportation . One of the most popular activities for tourists today is a cruise down the Nile. Lake Nasser – one of the world’s largest man-made lakes, it is named after the president of Egypt from 1956 to 1970, Gamal Abdel Nasser. Lake Nasser is renowned for the best freshwater fishing in the world. The lake is approximately 310 miles (1550 square miles) in length and in certain places, it can reach to a depth of 600 feet. It was built in the 1960’s when the world famous High Dam was also built. Lake Nasser and the Aswan Dam provide irrigation and electricity for all of Egypt. However, the lake and dam aren’t without controversy as you’ll discover in King of the Desert, Captive Bride. The Red Sea – Beneath the crystal surface of this sea, one can find an oasis of reefs, coral formations and living creatures. Known as the place where the earth meets the ocean, the Red Sea is one of the world’s most beautiful yet natural seascape environments. It is located between Asia and Africa. The Valley of the Kings – One of the most famous archaeological sites in the world, the Valley of the Kings was used as the burial ground for Egyptian pharaohs in underground tombs. Located in the Theban hills, these wadis (valleys) were chosen as the sacred place because of the smooth white limestone walls that could be carved and decorated to showcase the history. The valley is also close to the sacred Nile river, easily reached by the elaborate funeral processions that brought the King’s mummy to the tomb. The Valley’s steep cliffs afford the ideal locations for guard huts and offer sweeping views of the entire area. A must see for any Egyptology buff. The temples at Kom Ombo – Ancient Egyptians worshiped and feared the crocodile in honor of the Crocodile god, Sobek. 30 miles North of Aswan, Kom Ombo was once a sanctuary for a large number of crocodiles and the center of worship for Sobek. The temple is known to be unique in that it consists of twin parts that are attached but completely separate; each temple has its own halls, chapels and entrance. Visitors can also view crocodile sarcophagi and mummies excavated from the nearby City of the Dead. Olivia is fascinated with the crocodile god, Sobek, and I am, too. The Omar Khayyam – a must-see place for those who love to gamble. The Omar Khayyam is a casino and also known to be one of the best hotels in Egypt. Open day and night, they offer free drinks as long as you’re playing. Don’t forget to stop by Piano Piano at the hotel, for a wonderful meal and great live music. It is frequented very often by residents of the area. The Pyramids of Cheops (Khufu) – the oldest and largest of the pyramids on the Giza Plateau, it contain an estimated 2.3 million blocks. Some of you may want to visit in the evening to catch The Pyramid Sound and Light show of the Sphinx and Pyramids. Very much worth the trip! The Egyptian Museum in Cairo – houses more than 136,000 artifacts from pre-Islamic Egyptian history! Don’t forget to visit the top floor to view the Mummy Museum. The Mena House – a grand hotel built in 1869 and the first hotel Sheikh Fehr takes Olivia to after she’s rescued from the Ozr prison. The Mena House still continues to enchant guests even today. Known to have hosted great emperors and kings, it boasts luxurious surroundings and antiques. The Mena House sits in the shadows of the Great Pyramids in Cairo . A truly beautiful sight to see!